The most anticipated moment of the deer hunting season is closing in on us, the rut. Bucks are cruising, does are entering estrus and the action is heating up for hunters. So, clear your calendars and tune in to The Revolution this week as we demystify rutting buck behavior in order to more effectively fill your tags. Accompanying us for an exclusive two-part rut update will be whitetail gurus Lee and Tiffany Lakosky, hosts of Crush with Lee & Tiffany on Outdoor Channel. Then, Greg Randolph, VP of Marketing for DECKED, will aid us hunters in addressing vehicle storage issues. Finally, Bonnie and Mike McFerrin, of Legends of the Fall seen on Outdoor Channel, will tackle warm weather, bows and broadheads, family participation and much more. The Revolution and our "Rut Ready" broadcast is presented by Outdoor Channel, Sportsman Channel, World Fishing Network and MyOutdoorTV. Most hunters live for the rut. They plan their vacations around it and rearrange their lives so they can get in on the action happening in deer country. Lee and Tiffany Lakosky, of Crush with Lee & Tiffany on Outdoor Channel, hunt every day, but admit there are certain time frames that they look forward to more than others, like the first 10 days of October. Lee says that resident bucks many times haven’t broken off yet in early October and are still on their regular feeding patterns making their movements more predictable. In addition, the Lakosky’s like late season December hunting as deer have returned to their feeding patterns post-rut. What about the rut though? The rut is packed with action and Lee says if you are looking to hunt any deer, this is the time. However, Lee and Tiffany hunt specific, mature, deer and say that the rut makes it more difficult to target individual bucks. How do they decide what bucks make their hit list for the fall season? The Lakosky’s manage their land and resident deer herd based on age structure and say that they target deer 5 years old or more. This kind of management can require a lot of restraint as Lee says they’ve passed on incredible deer that were only 4 years old. However, the results often speak for themselves as is evident by Lee’s harvest of a 201-inch monster earlier this season. Tune in as Lee and Tiffany Lakosky talk in depth about hunting the rut, targeting mature whitetails and so much more in a special two-part interview, this week on The Revolution. 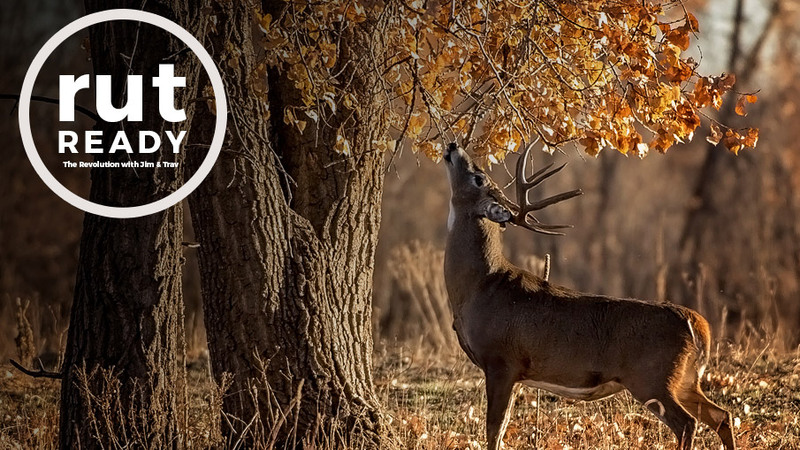 The rut is on and Bonnie and Mike McFerrin, hosts of Legends of the Fall on Outdoor Channel, are taking a break from the action to join Jim and Trav this week. As Texas natives, the McFerrin’s live in deer central with a population of more than 4 million statewide. Because of the sheer size of Texas, that also means that rutting action is widespread and can be found from late September clear through December depending on the location. Mike tells Jim and Trav that the best part of hunting South Texas is the opportunity to hunt the rut in the Midwest, and then return to Texas to catch the rut all over again. Tune in as they talk about traveling to Kansas to catch the rutting action and the gear they use. They’ll also talk about Bonnie’s introduction to hunting as well as what a “trophy” means to them. Listen this week on The Revolution. As outdoorsmen and women, we spend an incredible amount of time in our vehicles. Guns, bows, camo, fishing poles, and a plethora of other gear gets crammed into the cabs of our trucks. While all of this is more than necessary, it takes up valuable space in the cab, makes it difficult to find things because it’s unorganized, and can even lead to breaking expensive gear. Seeking a solution to these exact problems, we introduced you, our audience, to DECKED back in September. Many of you, just like us, were really intrigued by this system and have left us great feedback online. Because of the interest and questions that still remain about DECKED, we invited Greg Randolph, the VP of Marketing for DECKED, back to talk about their storage systems and how we can better organize our gear and declutter our cabs!